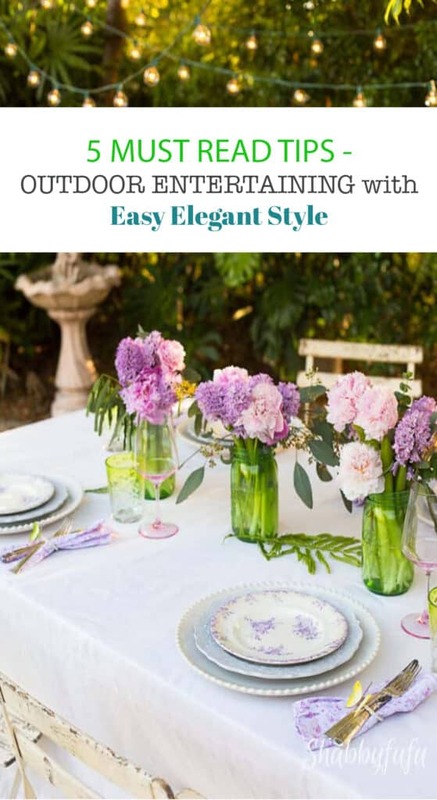 If you love the idea of hosting and doing a ton of outdoor entertaining during the warmer months of the year, you’ll probably agree with these reasons why entertaining outside is amazing. 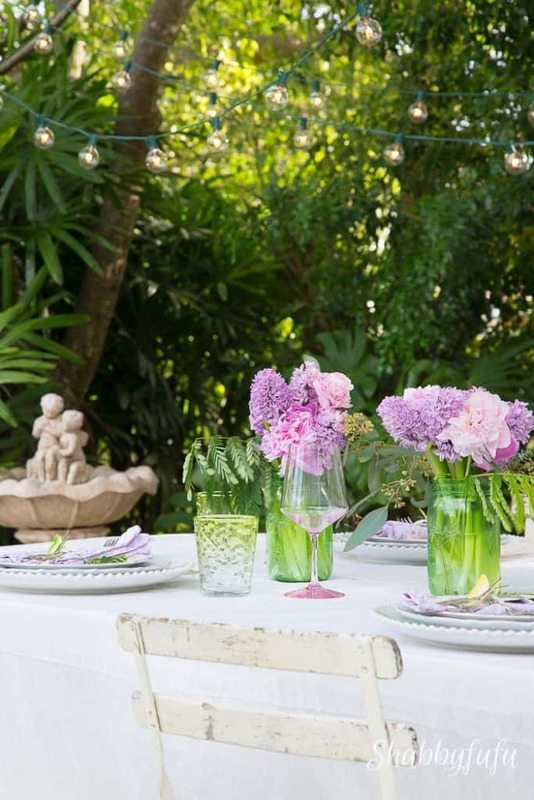 This has been the year of outdoor dining and outdoor entertaining at our home, and we are enjoying it more than ever since making some changes and updates! I can’t believe that it took so long to get going with these real estate revisions, but it’s kind of like potato chips. You get on a roll and can’t stop at one chip! What’s not to love about being out here? but you can take any small space and create a haven! 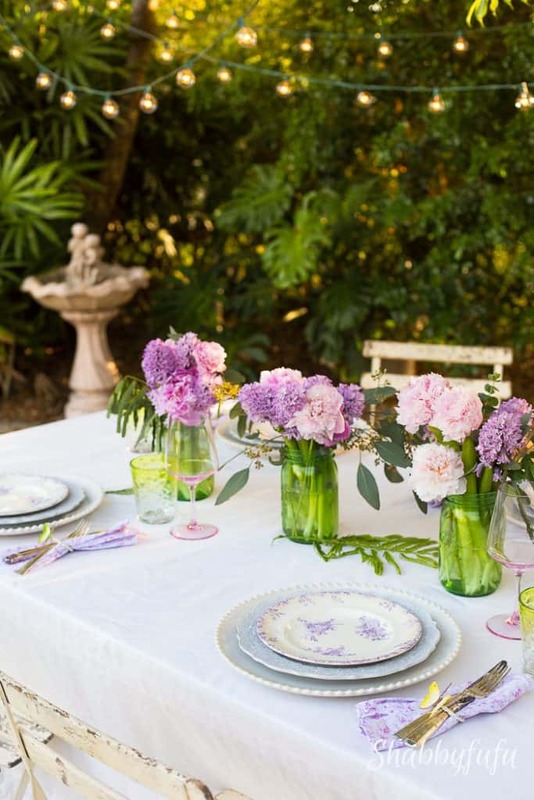 Here are my top reasons why I love outdoor entertaining! Since we installed our romantic pea gravel patio, we have found ourselves out here as often as possible, especially in the evening. The air is so fresh outdoors and the breezes are sublime, even into the hot summer months. This area sits under a Plumeria tree and the shrubbery has some Night Blooming Jasmine mixed in. The fragrance is intoxicating and light enough with the breezes to waft around lightly. 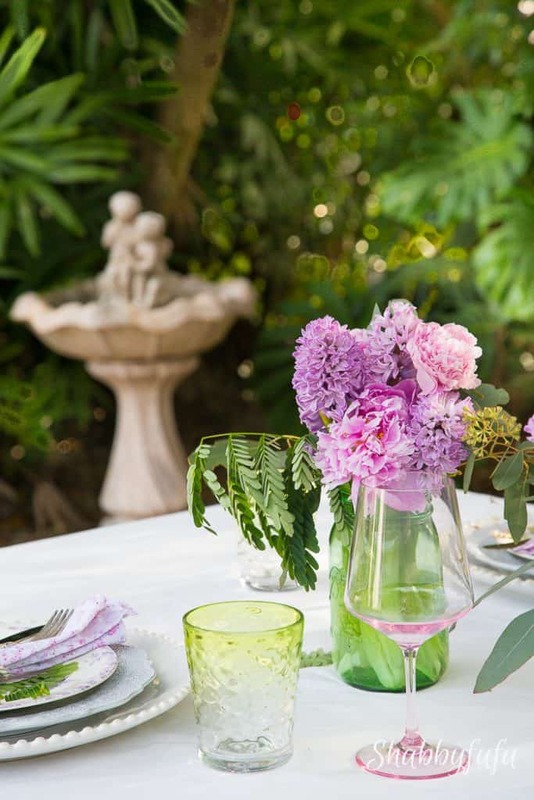 Take this outdoor entertaining concept to your porch and purchase some potted plants that will give off a nice scent. Some ideas to consider are small rose bushes, gardenia or lavender. You don’t need a lot of room and can do this on a condo balcony just as easily as a back yard retreat. Our kids are grown and this past weekend for Easter we had some great friends over who have that empty nest as well. With time to linger, we sat outdoors and just enjoyed the casual laid-back atmosphere of being outside, together. The hours just slipped by into the night. 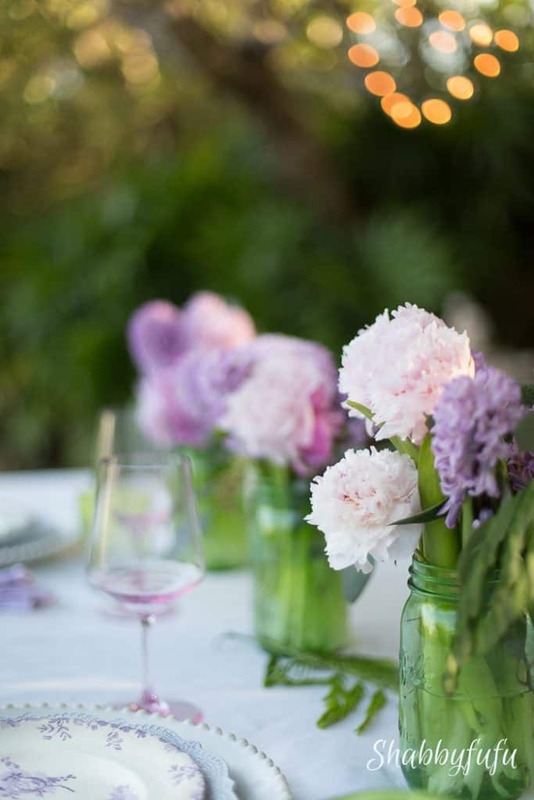 No need to hurry and rush when outside entertaining and it called to mind the many visits to European bistros where relaxing is simple and easy. I enjoy combining casual and formal in the table settings as well, and here I’ve used new pieces and old…porcelain and plastic. Everything looks better against the lush greenery of the garden. 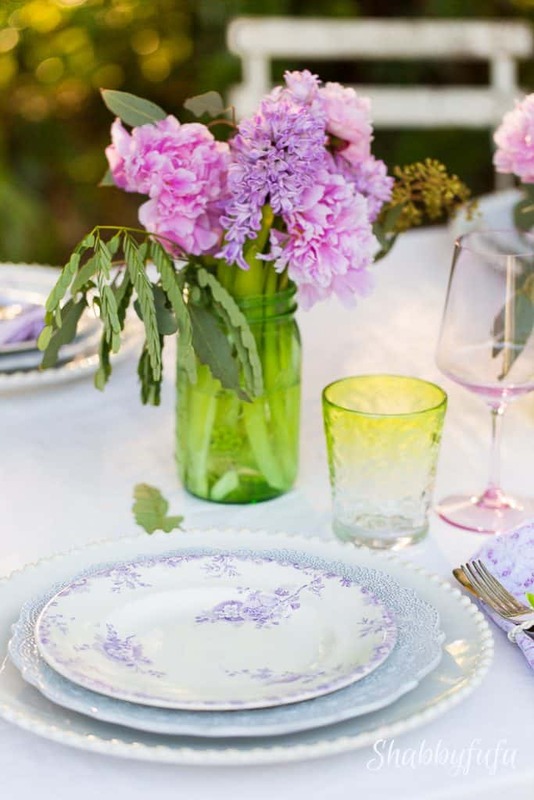 The colors of the dinnerware and fresh florals just pop. Sometimes I’ll use a tablecloth like this ruffled duvet turned cloth and sometimes not. 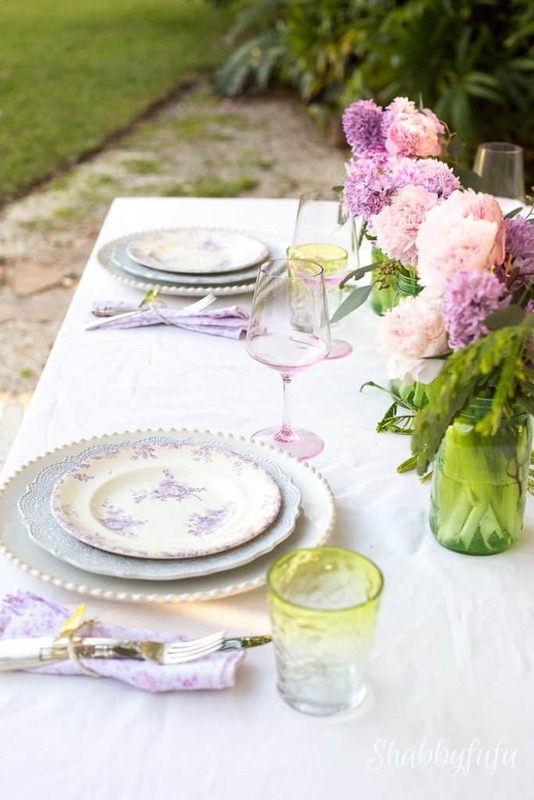 Depending on what pieces you use for entertaining guests outdoors, each table setting can look absolutely different! Why is it that food tastes better outdoors? Or am I just that romantic girl who dreams so? Perhaps it because of the tranquil way we wind our batteries down outdoors and simmer down from the day. There has to be a reason why cafes in Europe have had outside entertaining tables for centuries now…and by the way, my folding wood bistro chairs are authentic and purchased from a cafe in Provence. As a photographer, I periodically sit out here and just watch the light play through the trees. Ever observant I have learned when the optimum time is to shoot outdoors and enjoy watching the dappled light. Shade is best here in Florida for dining. The days are nice and long to enjoy outdoor entertaining for several hours at day’s end. 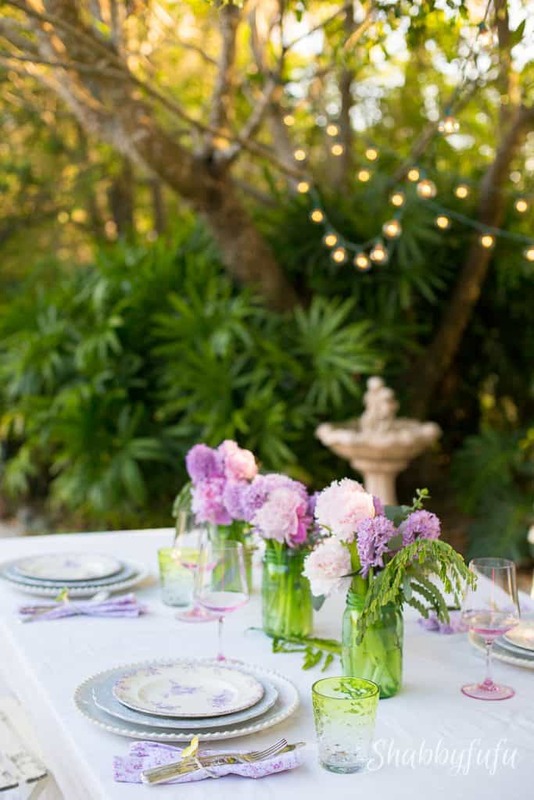 What do you love about the idea of entertaining outdoors?